4-26 We made a break for El Capitan despite the variable weather forecast. None of us thought that we would get the weather windows that we did, but it remained cloudier with a lower ceiling down canyon most of the day while the upper basin had some consistent and fairly long lived blue sky moments. After the long approach to the base of the east face of a bit more than five hours, we began climbing the route we hoped to ski. The initial half follows a couple obvious gullies. From there a steep traverse marks the first crux as the climber must surmount a rock step on 50+ degree terrain above cliffs. With firm snow the move proved to be technically fine, and the exposure intense. Continuing a traverse and then ascending through the next crux an icy chute allows entrance to the upper face pitched from 50-55 degrees. 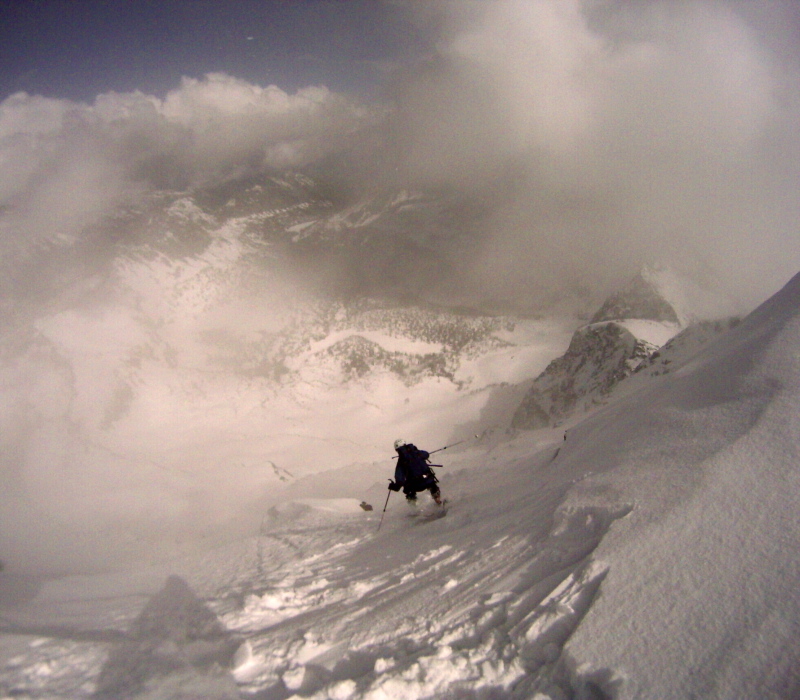 At this point our weather had deteriorated and we cramponed our way to the summit in a full whiteout. Don and Brian climbed the rocks to the summit while I watched and then we debated skiing the line. None of us were thrilled to ski the face in a whiteout so we hunkered down to wait. We did not have to for long as a perfect window opened up for us and the beautiful face descended below us in splendid sunshine. Brian dropped in first left of the summit cornice and made slow deliberate turns onto this wildly exposed and technical face. We watched for a few minutes while he negotiated hard snow around rocks before heading to the climbing line right of the cornice. 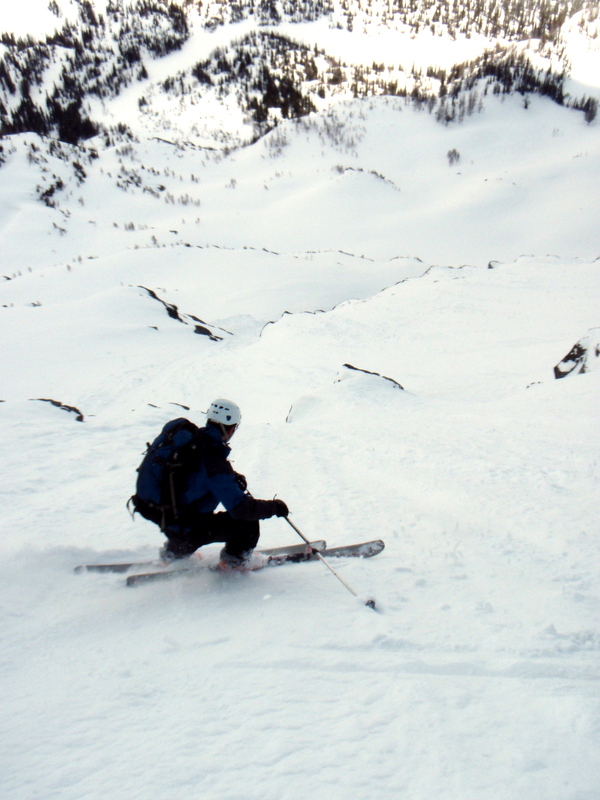 I skied next and carefully linked turns between bouts of sideslipping. It was in hard conditions of refrozen corn with about an inch of powder on top. I passed Brian on the upper face and continued down skiing through both cruxes, trying to keep my nerves calm by focusing on the skiing and not stopping anywhere for too long. I managed to snap a couple of photos of Don and Brian skiing the upper face before traversing left passed the final crux where I waited for them. Below was variable more softened but with plenty of wet slide debris to reconnoiter. Skiing the final turns on low angle corn was heaven as we enjoyed the smooth slopes and sunshine alive at the base of this grand Bitterroot test piece. 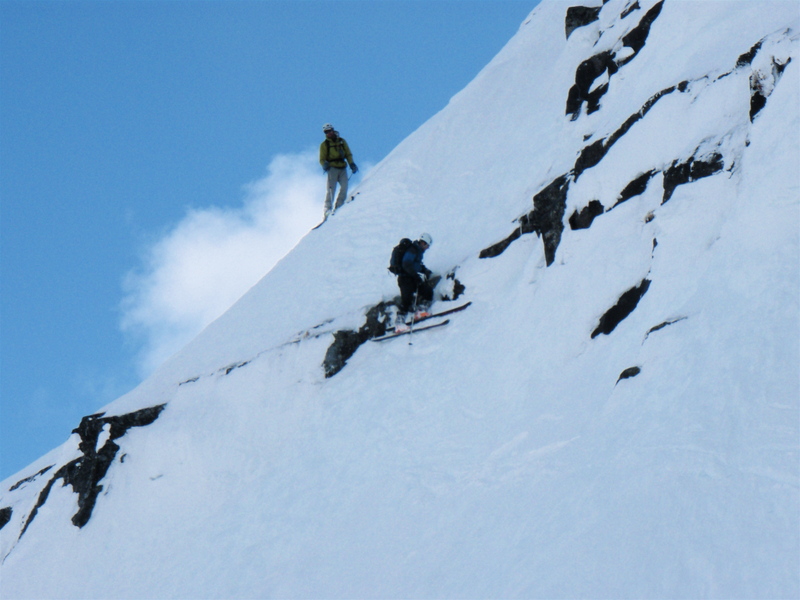 After having been shut down last year in our attempt it was great to have made the trek this year and to ski it in fine style despite the challenging hard snow conditions. Hopefully powder next time! 5-2-09 Yesterday was a beautiful day in the mountains, and taking full advantage of this weather window, Chris and I headed as far up Blodgett Canyon as we thought we could for a day ski. It turned out to be a long day of fourteen hours and a I am tired and somewhat lame today as is the dog Pearle who begged hard to come. Just passed the High Lake trail junction we began climbing the south facing slope to gain the ridge and the hight point there, with our destination the Sear’s Lake couloir and basin. With new snow to contend with, 6-8 inches above 7000′, travel was slow. 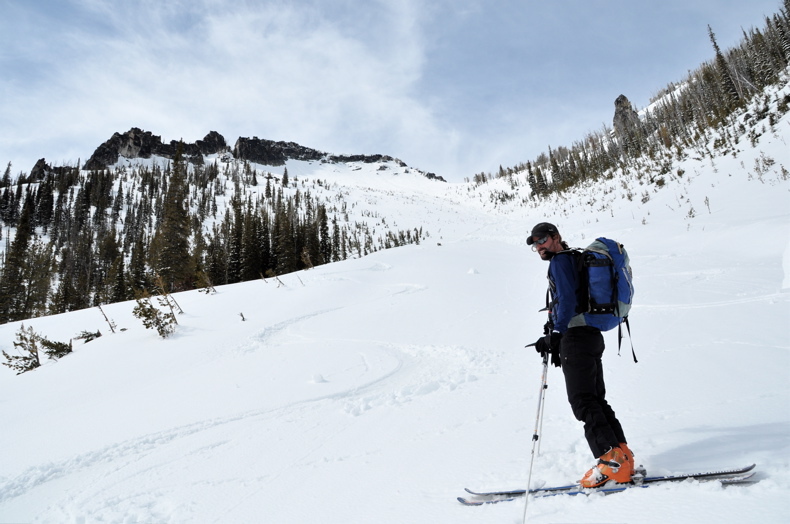 Our route finding worked well and we skinned the steep face and then into the gentle gully west of the peak that guards the east ridge of Sear’s Lake basin. Gaining the ridge we had a great view across Mill Creek to Castle Crag. Working our way up the ridgeline we encountered the couloir where the map has it placed west and below the summit a handful of vertical. 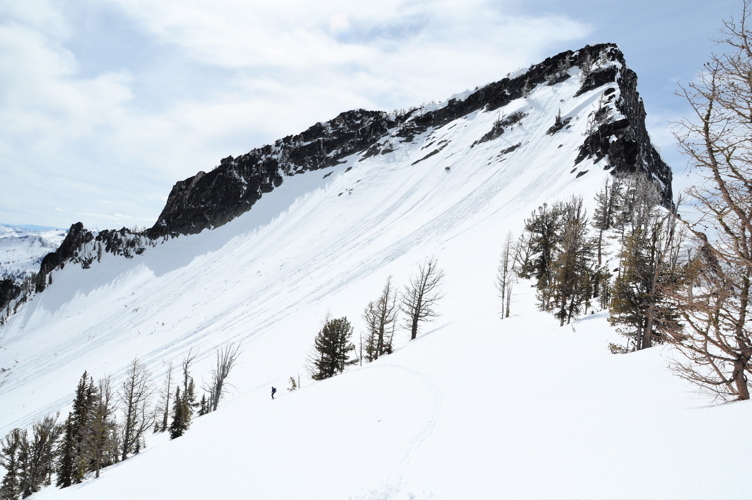 It appeared nice and powdery at the top and it was, but in many…okay most places, it had sluffed down to the icy bed surface and we control skied the line alternating between ice, slough deposit and a few sublime pokes into pristine powder on the sides of the gully. Exiting the trench in this rocky, treed face skied us onto a fine apron that rolled over and sang us down to the lake below. The peaks and bowls framed across the drainage above the treetops and the lake was a fine way to spend the lunch break. 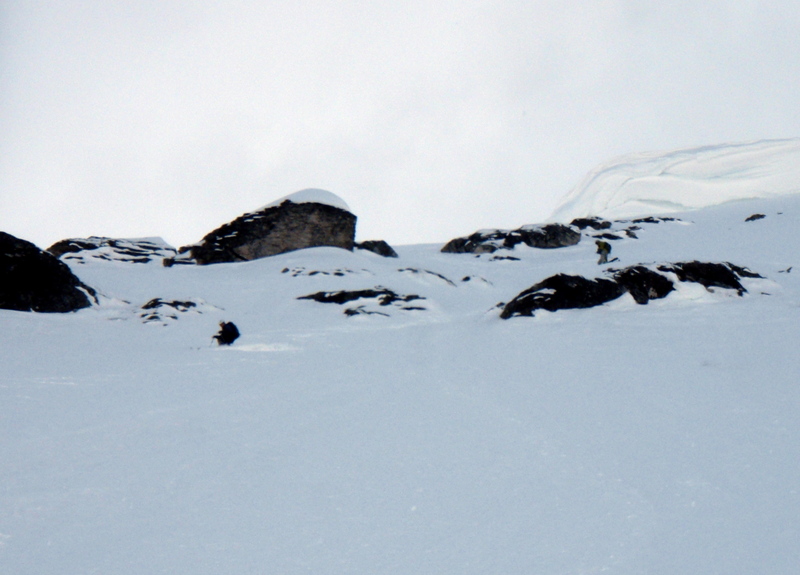 Pearle had abandoned us at the icy crux and headed back up and I thought she would make her way home from there. As we headed back up and out to the Blodgett side, she came bounding down to meet us, obviously pleased with herself and success in finding us via another route, unless she later braved the icy crux. Climbing steadily west we broke onto the ridge heading for the high point on this portion of Printz Ridge and the great south facing avy path descent to the creek. 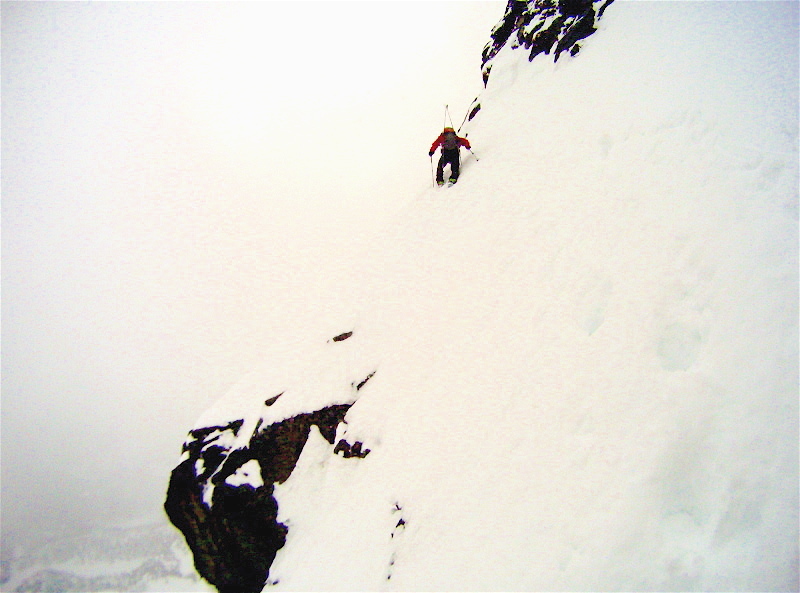 We declined trying to climb and summit ski as the thin veneer of snow on the upper portion rocks was likely rotten and dangerous. Tired as well, we pointed the skis down this sweet corn run and farmed for over three thousand vertical. The lower run has a rock band running through it and we had to negotiate a snow free brushy spring lane left of center to reach the snow again below. 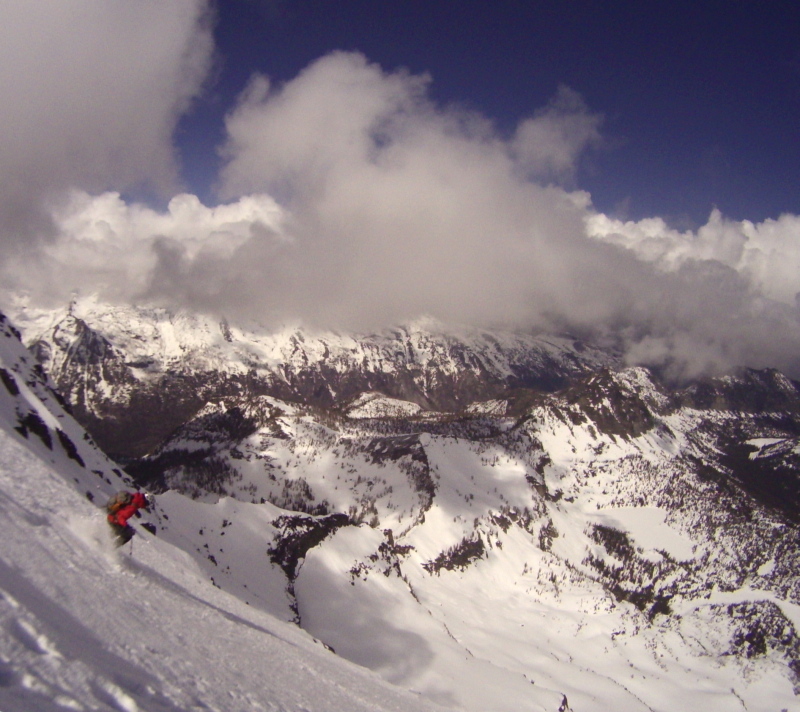 From there we skied down to just above the flats and feasted on the Rocky Mountan spring water growing out of the run. Back to the trail then and the long march 7-8 miles out to the truck. 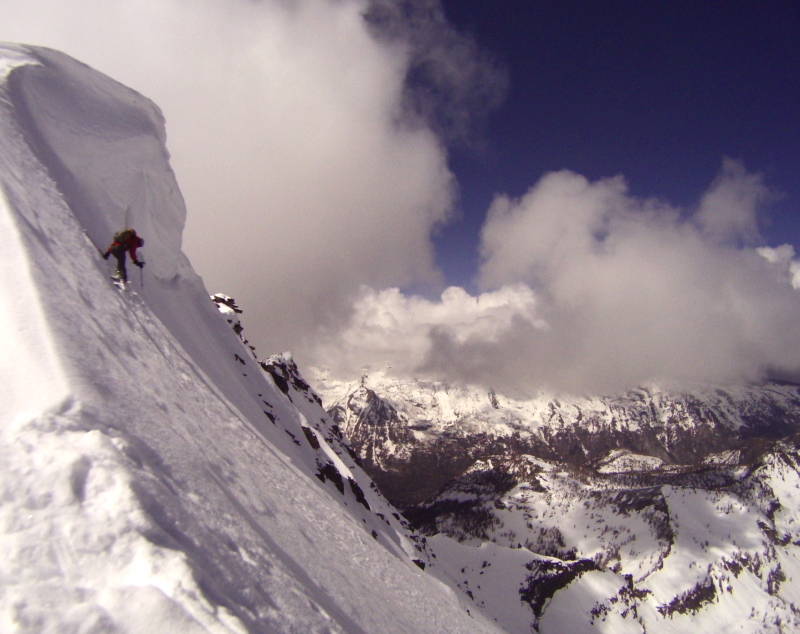 With the new snow changing conditions back to transition we caught both the couloir and the south face in waning winter conditions. 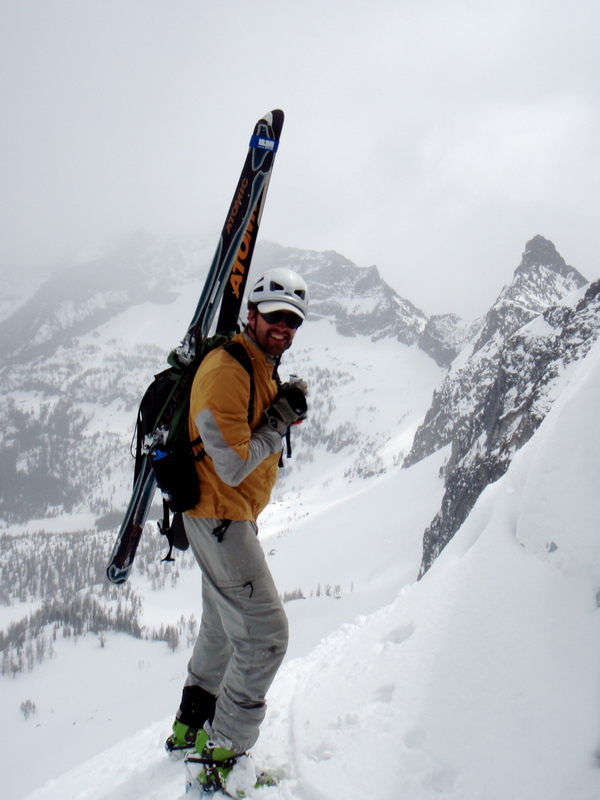 That will likely be my last trip up one of the deep canyons this spring to ski a south face as they are melting out and going rapidly now. 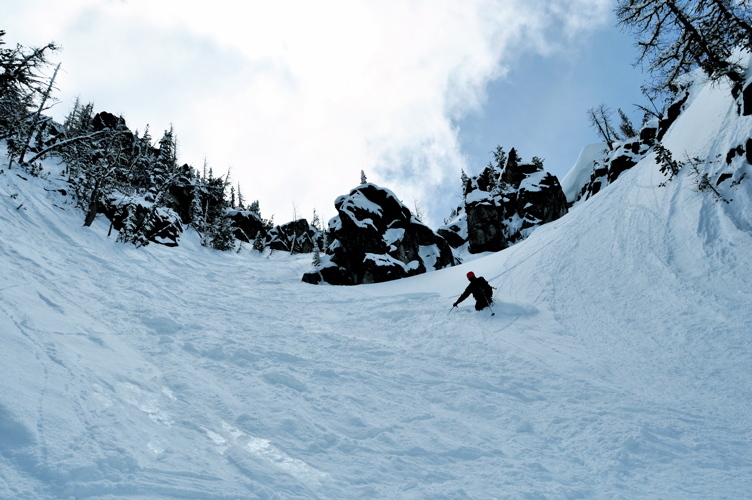 Another great season of new peak to creek runs with this one an inspiration for more next season. 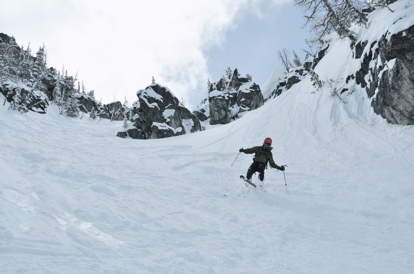 Skiing in the Valhallas, B.C.